Louie J. Roussel III was, at one time, the youngest bank president in the United States. He is a lawyer, and was once majority owner of the Fair Grounds race track. Above all, Louie is an ardent race horse enthusiast and was looked upon by his peers as one of the top trainers in the U.S. Through the course of his life, he has taken part in many competitive events. None was bigger than the one he was personally involved in in 1977. Competing with a tenacious foe, throat cancer, he was, with the help of the Almighty, the ultimate winner. Louie would be the first to tell you the traumatic experience had a lasting effect on his life. Shortly after attending an auction where he purchased a new, exciting colt, he attended a Christmas Mass which led to his naming the colt "Risen Star." Until this time, Risen Star was the greatest horse Louie had had the pleasure of training. From the very beginning, the dark bay colt was believed by Louie to have something very special. Some other notable horse trainers thought that the colt was too big. Louie realized that even though he was big, he had a fluid stride and could run on hard or soft surfaces. Risen Star made his debut winning the 6½-furlong Minstrel Stakes at Louisiana Downs. 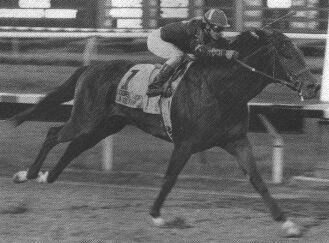 This was followed by winning the Louisiana Derby in 1988 at the Fair Grounds. National attention came when Risen Star won both the Preakness and Belmont Stakes. The latter was won by 15 lengths, despite an injury. It was, under the circumstances, an incredible feat. In winning two of the three legs of the Triple Crown, the big horse with an equally big heart became the most talked about horse of the year. Because of Ronnie Lamarque, who was part owner of Risen Star and a crooner of sorts, Star also became the most "sung about" horse in the history of horse racing. Risen Star was given his name because of a religious inspiration and was trained by a compassionate owner. It just might be that divine guidance helped the thoroughbred win $2,029,812 during his racing days. An additional $7 million was earned by the owners when half interest was sold for the colt’s breeding rights. Risen Star generated much happiness during his racing days, for his owners and racing fans. Thousands and thousands of people who never saw Star run, or, for that matter, ever heard of the champion colt, have benefited from its winnings. Roussel promised the Little Sisters of the Poor, a Catholic order of nuns, 10 percent of the Star’s winnings. It is only fitting that Christmas, a season of love, charity and compassion, is woven throughout this story. Everyone in the racing industry was shocked when they learned Risen Star died Friday the 13th of March, 1998, 10 years to the day after winning the Louisiana Derby, the race which catapulted him into fame, fortune and ultimately this story of love, charity and compassion.